The Honorary Austrian Consul for Bermuda and The Bermuda International Film Festival’s [BIFF] Purpose Trust will be hosting a screening of the movie ‘The Last Salon’ on Saturday, February 24 at 7.30pm in the Trudeau Ballroom of the Hamilton Princess. 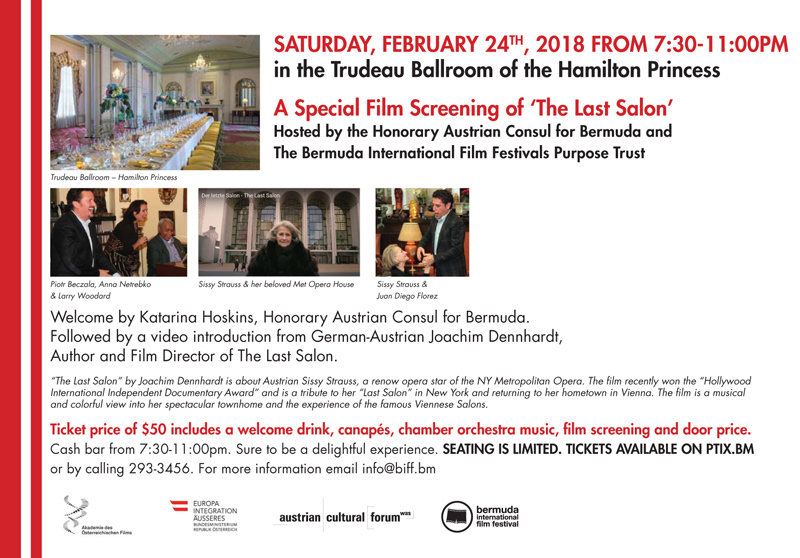 A spokesperson said, “As a special treat during the performing arts season, the Honorary Austrian Consul for Bermuda Katarina Hoskins is hosting a screening of ‘The Last Salon’ in the exquisite Trudeau Ballroom of the Hamilton Princess at 7.30pm on Saturday, February 24th. “The movie is a delightful expose of the professional life of Austrian Metropolitan Opera [MET] star Sissy Strauss as she leaves Manhattan and returns to Vienna. It is a musical and colorful view into her spectacular townhome and the experience of the famous Viennese Salons, as her colleagues from the MET join in impromptu song. “The evening will celebrate music and movies as it is held in conjunction with the Bermuda International Film Festivals [BIFF] Purpose Trust. The Ballroom opens at 7:30pm with chamber music by the Menuhin Quartet, with a piano interlude by Katie Matcham, along a complimentary drink with canapes. “The Last Salon’ is a compliment to the Bermuda Performing Arts season and a prelude into the Bermudan International Film Festival which will start on March 17th. Tickets for The ‘Last Salon’ are $50 and available at Ptix.bm, by calling 293-3456, or emailing info@biff.bm. “BIFF 2018 is slated for March 17th-25th, with many exciting activities. BerMovie Day is scheduled for Friday, March 23rd, featuring several Bermudian produced Short Films. This year, BIFF is hosting an Acting Workshops as well as a Make-Up for Film Workshop on Sunday mornings. BIFF sponsors the Bermuda Shorts [film] Competition annually. As one of only 26 Festivals that are Academy of Motion Picture Arts & Sciences® recognized, the winner of the Bermuda Shorts will automatically qualify for consideration [without full theatrical release] for the Short Film -Live Action Oscar®. “This year over 600 short films from around the world were submitted to BIFF for consideration. Nearly 75 short films will be shown during BIFF 2018. Equally important is the very popular BIFF Academy School Screenings shown during the festival week. BIFF will be hosting four to five School Screenings in the mornings at the Earl Cameron Theatre. Last year nearly 1,000 students attended for free.